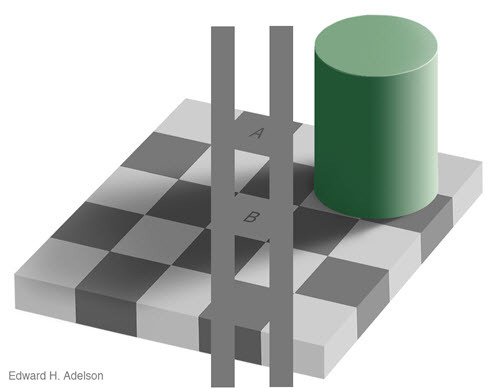 The checkerboard illusion is my favorite. Edward H. Adelson first showed this illusion in 1995, and I fell in love with it about a decade later. Despite understanding it, and looking at it over and over year after year, I am still amazed. We don't see what is really "out there". Instead, our minds process it and corrects the image. So, if something is lighter than its neighbors, it must be very light, while if it's darker, then it must be dark. Furthermore, if it is in a shadow, and still lighter than its neighbors, then wow, it must be really light. While if it is darker than its neighbors while in the light, then it must be really really dark. 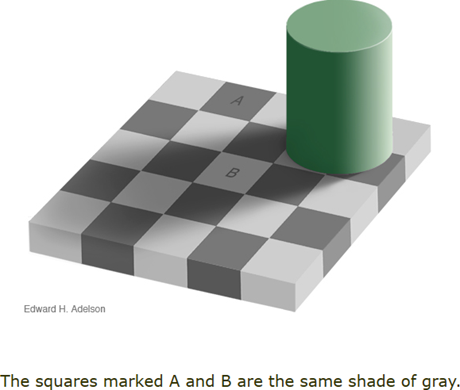 So, in the image below, squares A and B are actually the same color. Even with the full proof as show below with two lines allowing us to see that they are the same color, I still see them as different. To be completely honest. I actually printed the illusion, then took a piece of copy paper and made two holes in it the proper distance apart, so I could cover it and still see most of squares A and B. They really are the same color. For more on it check it out on MIT or Wikipedia.